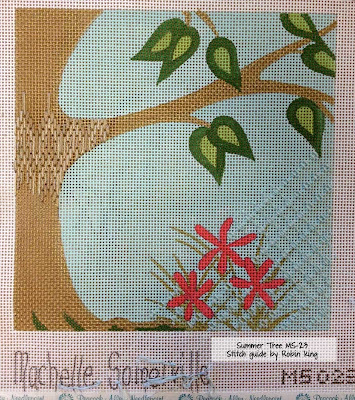 It's always fun to see the finished stitching from my canvas enhancement classes. Here are a few canvases with a common theme... DOGS. 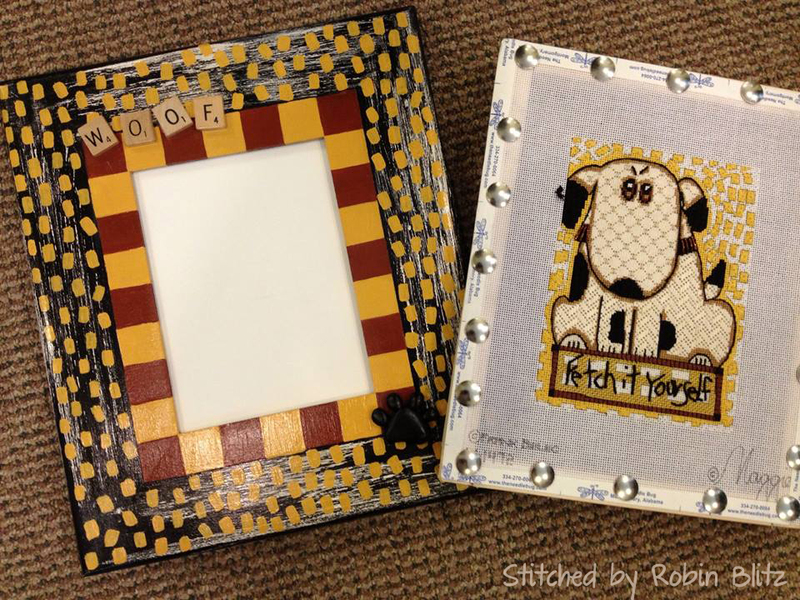 Two of the dogs are from artist Paper Russell who is represented by DJ Designs. Marlene Siegel stitched this Black Lab for a friend. 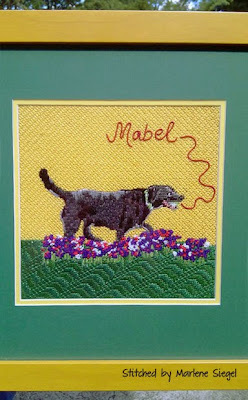 She wanted to personalize it further, and the DMC Memory Thread was suggested to spell out Mabel's name. Nice job, Marlene. 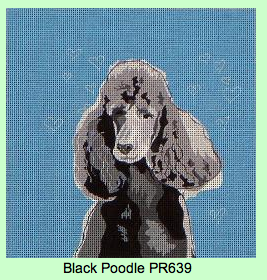 Another dog by artist Paper Russell was the Black Poodle. 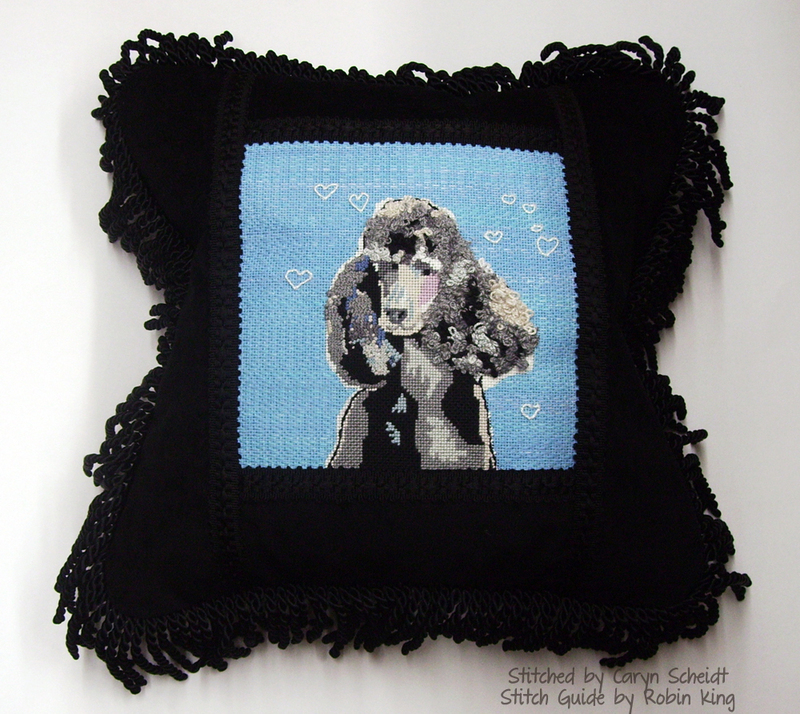 Caryn Scheidt had a Standard Poodle and wanted to bring this canvas to life. 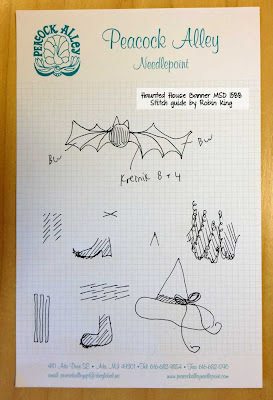 I showed her how to do the Gathered Stitch to achieve that the look of those ears. Caryn was most pleased. Me, too! 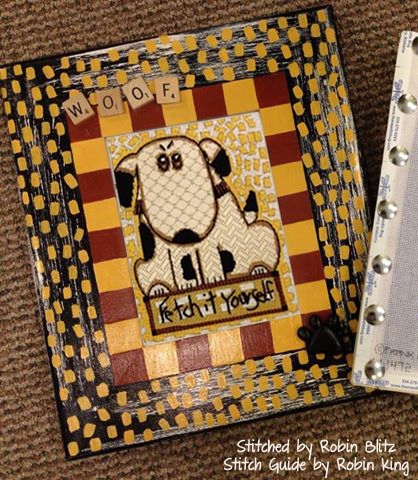 The last two dogs are from Maggie Co. and were both stitched by Robin Blitz in Montgomery, AL. Robin is a dog lover and Schnauzer owner. Our first collaboration was this Schnauzer by artist Charlotte Holder. 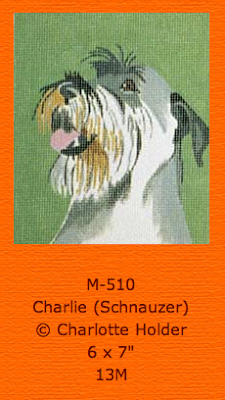 Schnauzer • M-510 • Maggie Co. 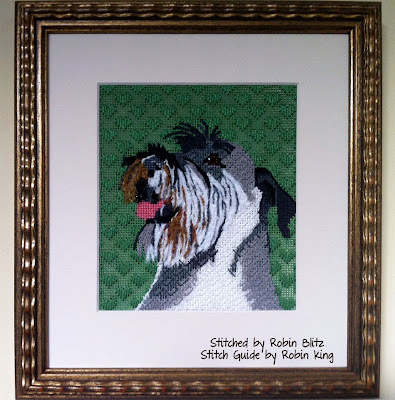 I designed a special stitch which was perfect for the Schnauzer's fur. Happy dog and Happy Robin x 2. And, our most recent collaboration from artist Frank Bielec (represented by Maggie Co.) was during a canvas enhancement class at The Needle Bug in Montgomery, AL. 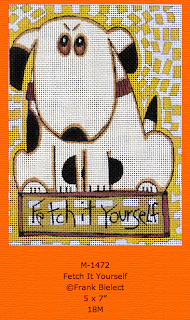 Robin selected this whimsical canvas, "Fetch It Yourself." 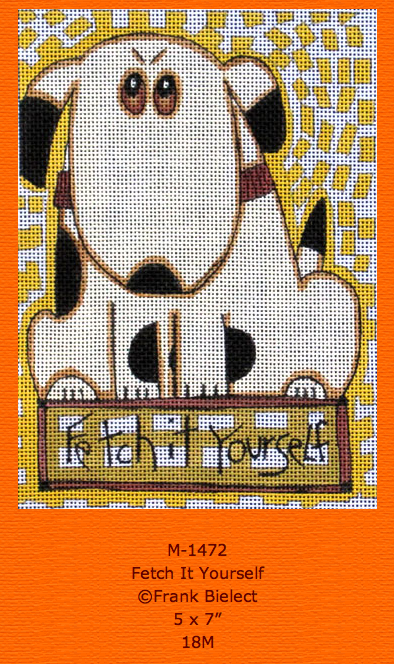 Fetch It Yourself • M-1472 • Maggie Co. Guess what?! She is already finished stitching it. 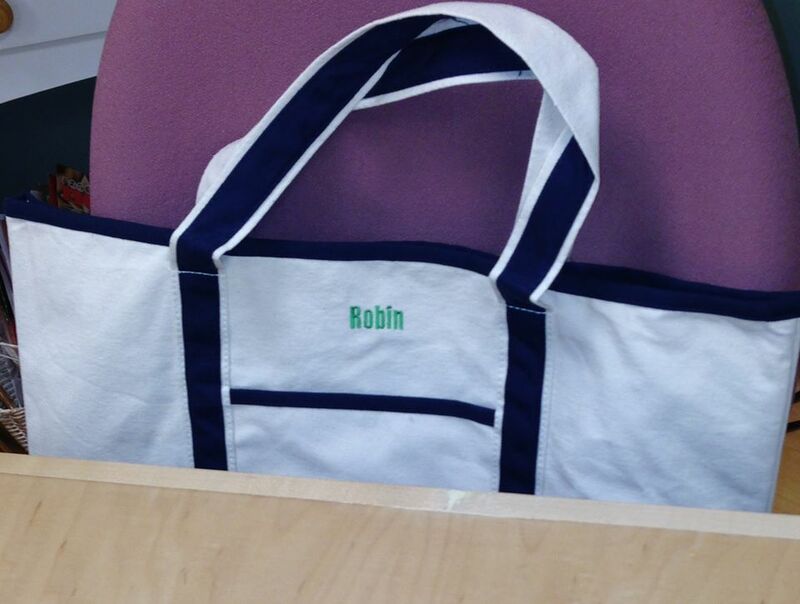 Go, Robin, go! 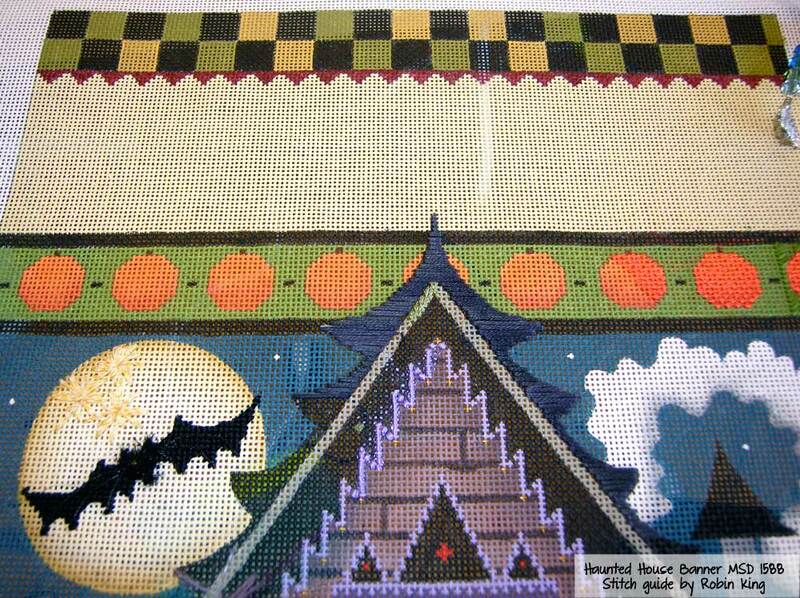 Look at the fun frame Robin selected... by Jim & Lisa Krause available from your favorite needlepoint shop. Here's a frame preview with the help from Photoshop. 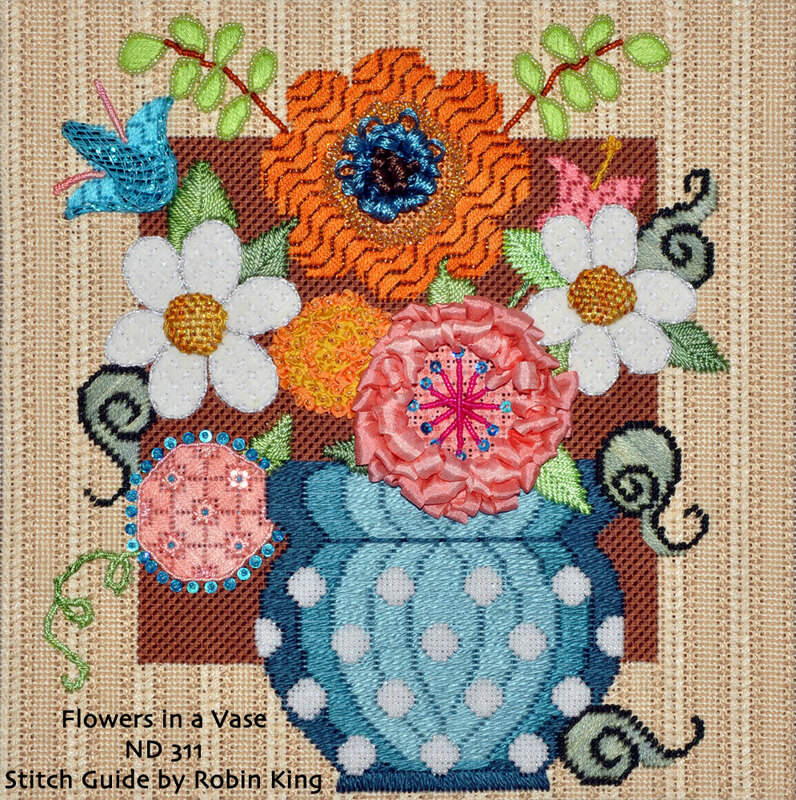 As always, my stitch guides are available. 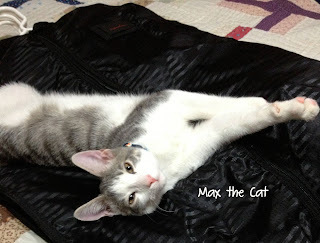 Just email me at creativecats@comcast.net for information. Shop Owner inquires welcomed, too. 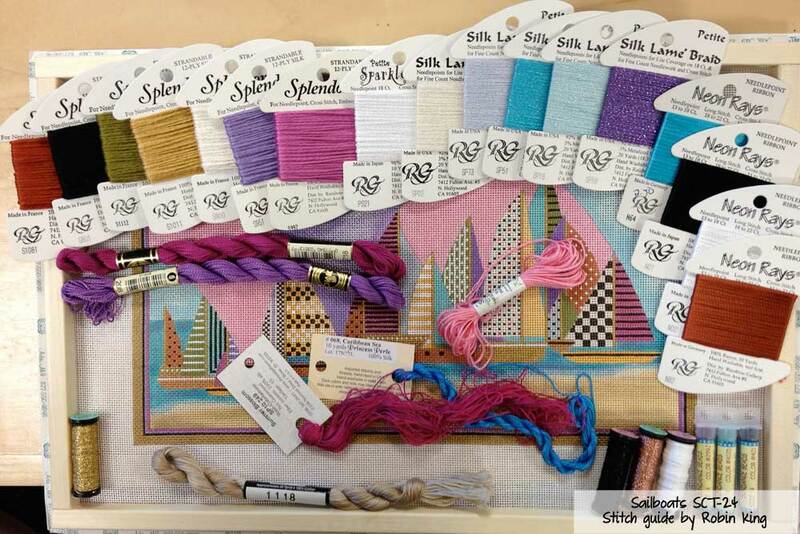 I am getting ready to go to Atlanta... to teach at In Stitches-Atlanta. I am most anxious to see their new store (conveniently located right across the street from their former location). You might ask: "What are you going to teach, Robin?" "Thank you for asking," I would reply. 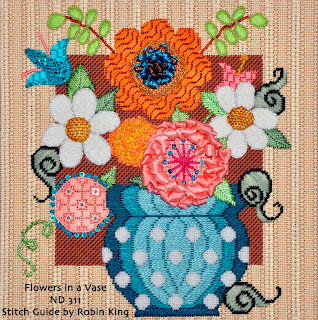 Flowers in a Vase for a 2-day class. Saturday, August 17 and Sunday, August 18. The pace will be comfortable and thorough. 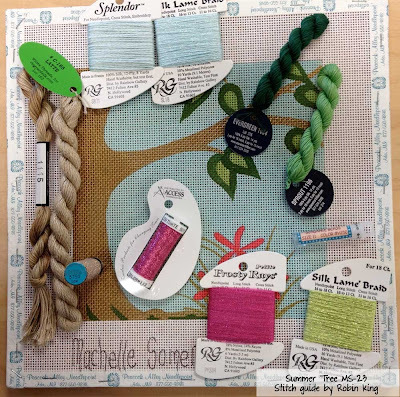 I will demonstrate the Stumpwork, Ribbon techniques, Raised Fishbone, Messy Beading, Sparkles... and anything which might be fun for the class. I will also share my secrets for successful beading. You know me... I'm the See One, Do One, Teach One gal. And, there will be lots of stitching done, too. How fun is that?! I am most appreciative to return to In Stitches-Atlanta. Very charming and friendly. 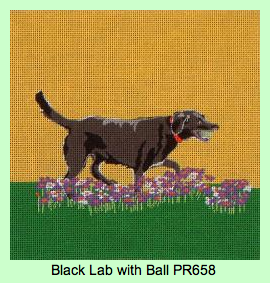 Just what every needlepoint teacher would hope for. Looking forward to seeing their new owner, Jeanene. I'll have my camera ready to take photos of their new place. Wonder what kind of stash enhancement I will do? 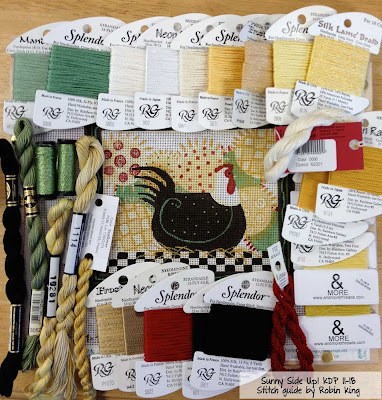 Threads? Accessories? Canvases? Oh, can't wait. Love flying to ATL. From Memphis: wheels up to wheels down is about 57 minutes. It's my home-away-from-home. Recently, I was sent a photo of a finished Flowers in a Vase by Kathy Hix who was in my class held at Stitch by Stitch in Larchmont, NY. 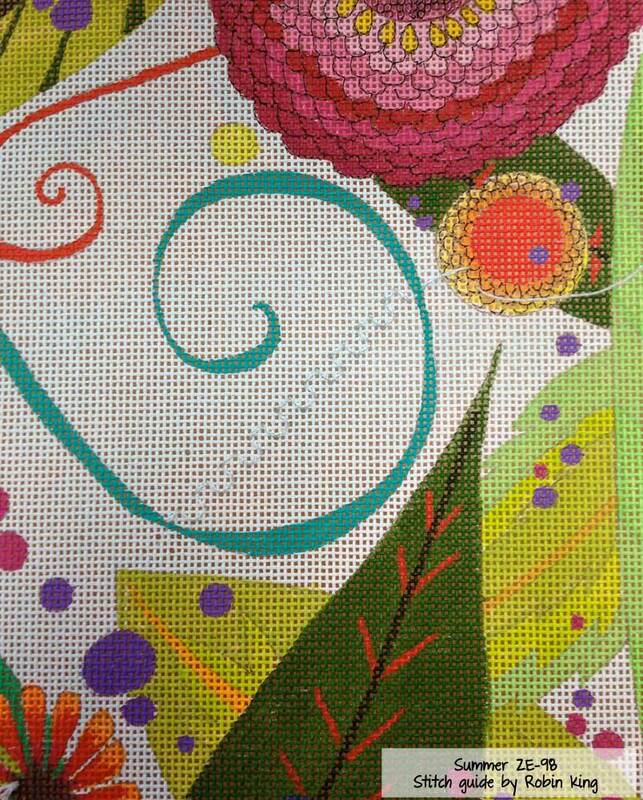 Look at the wonderful embellishments. 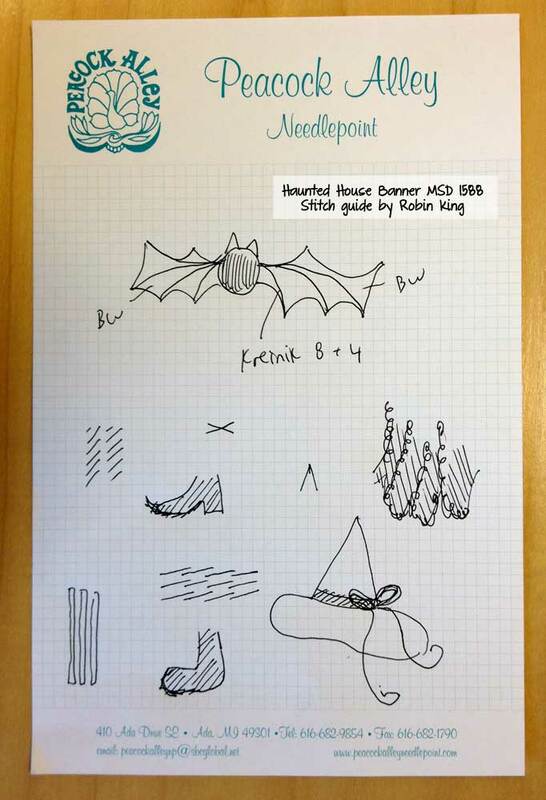 Begin with the stitch guide and then make it your own. Well, that's it for now. 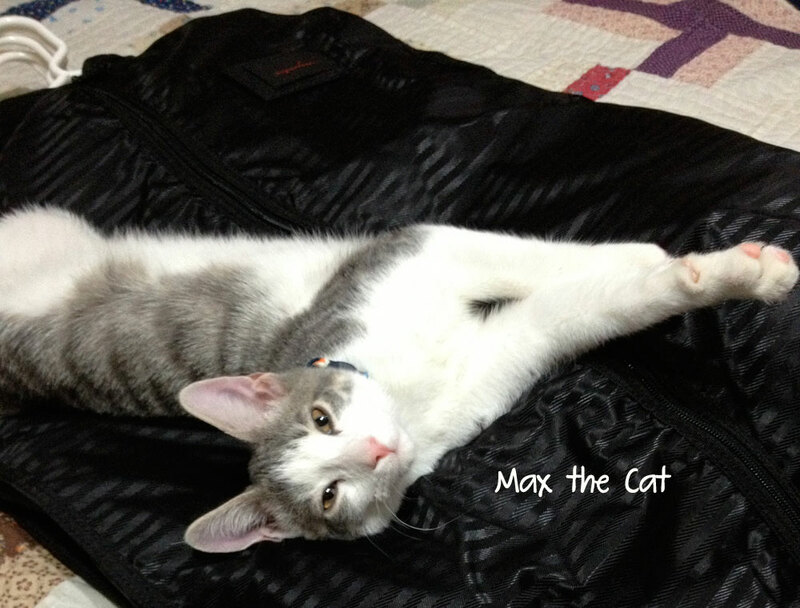 Time to gather and pack... all while not disturbing Max the Cat. He is so comfortable. Artfully drawn by designer, Machelle Somerville. Thursday evening was the Meet & Greet. 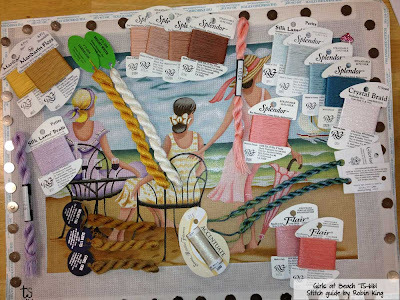 There were 12 women in attendance for my Canvas Enhancement class: one from the Chicago area, two from Cleveland Ohio, many from Michigan (both local and hours away), and one from Memphis. It was the first time to be in Sandy's shop for many of us. 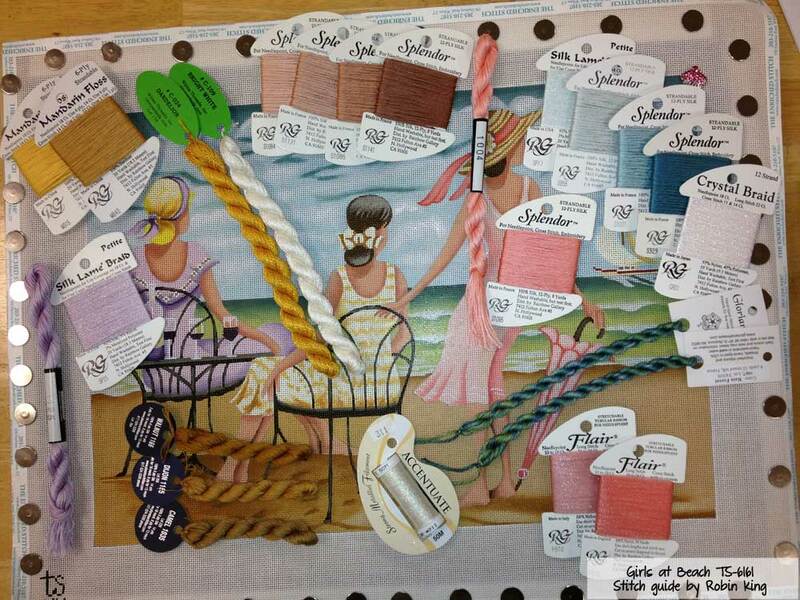 We made good use of the available time and began pulling threads for the canvases. 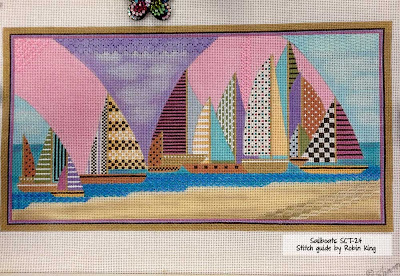 I can not think of one thread line not represented at Peacock Alley Needlepoint... what a joy! Friday morning the class began. To our excitement, we each had a wonderful gift from Peacock Alley: a heavy duty canvas tote with our name embroidered on it. But, wait... look at the reverse side. Sweet! 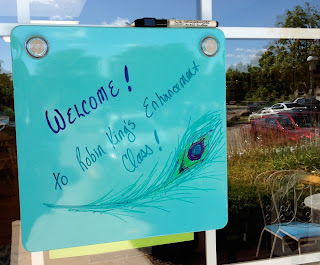 Awesome way to remember an event. 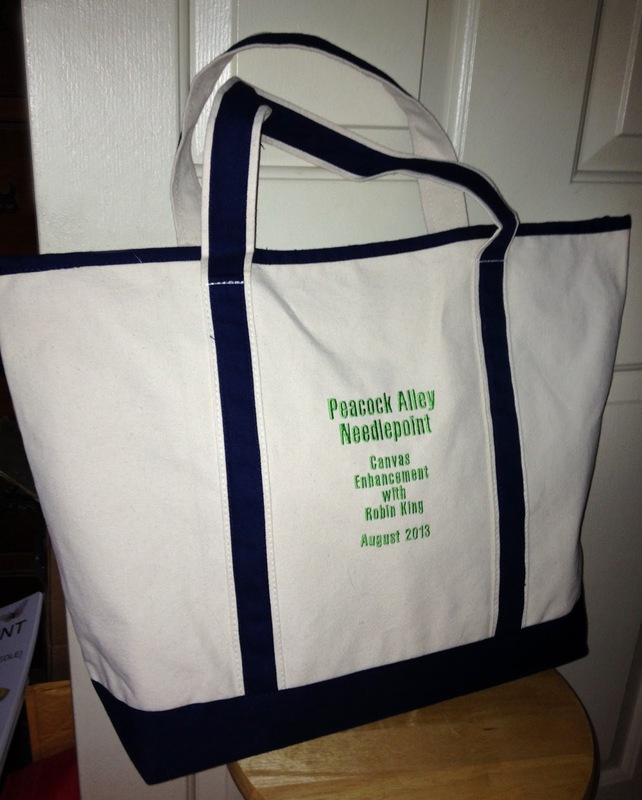 Thanks to all at Peacock Alley Needlepoint. We received more gifts through out the event. 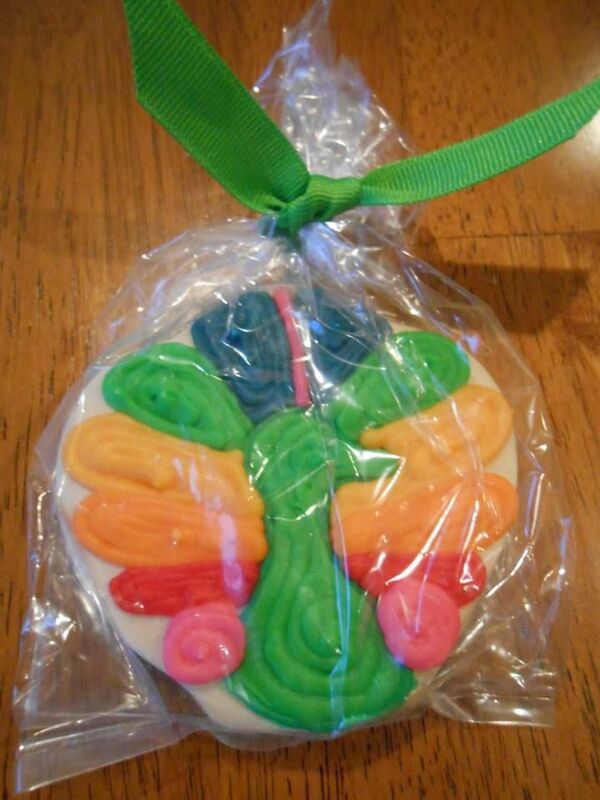 Everyone received a Peacock Alley Needlepoint beaded scissor fobs (in Peacock colors). Note the pretty Peacock charm. Peacock Alley Needlepoint scissors fob. Locally baked and decorated with the Peacock Alley logo. So tasty! Yes. 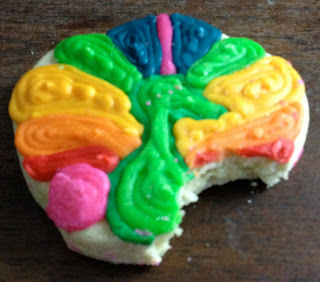 They were that good. 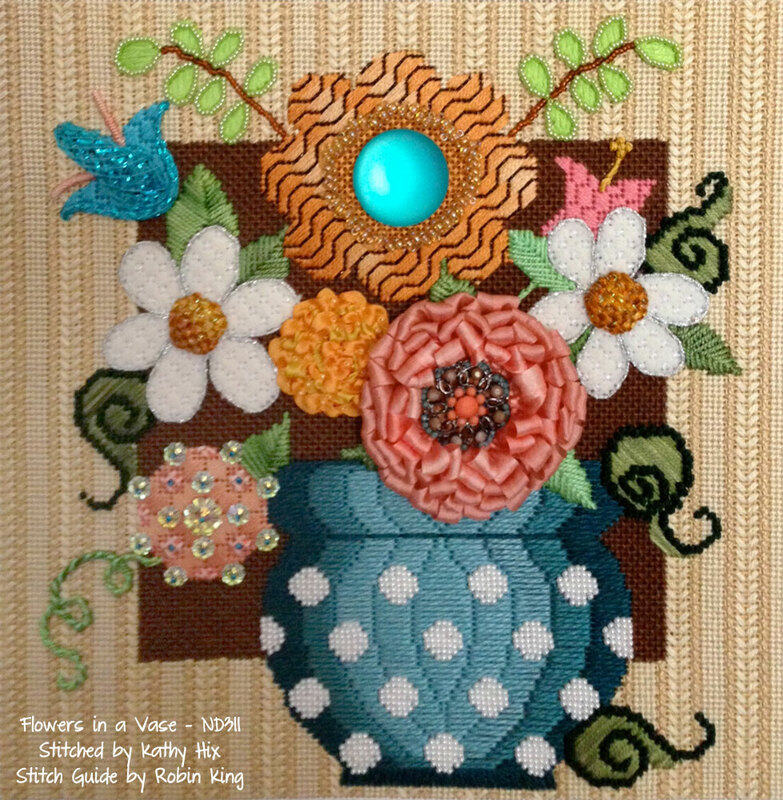 During class, I showed technique demonstrations related to someone's stitch guide: Colonial Knot, Colonial Running Rose, Twisted Lazy Daisy, Gathered Flair, and how to make a Kreinik Twisted Cord. We received a wonderful lesson from Judy: how to use a discard thread when stitching the background. 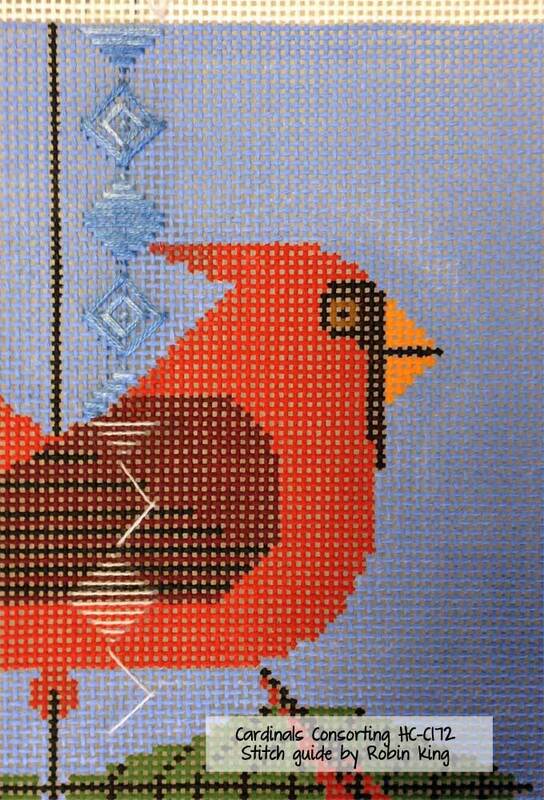 Judy was stitching the background of the Charley Harper piece, Cardinals Consorting (HC-C172). 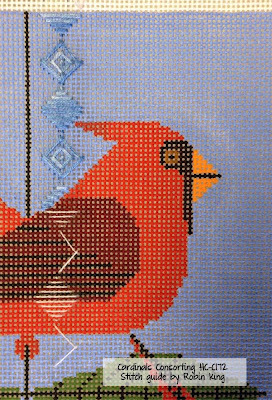 Note the discard thread Judy used to work the background stitch through the Cardinal. 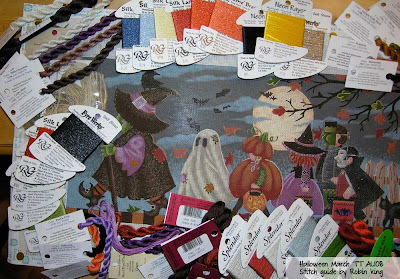 Once she made it to the other side, she will continue again with the pretty overdyed thread. Then, the discard thread will be pulled out and thrown away. It's always fun to witness an "ahh-ha" moment. 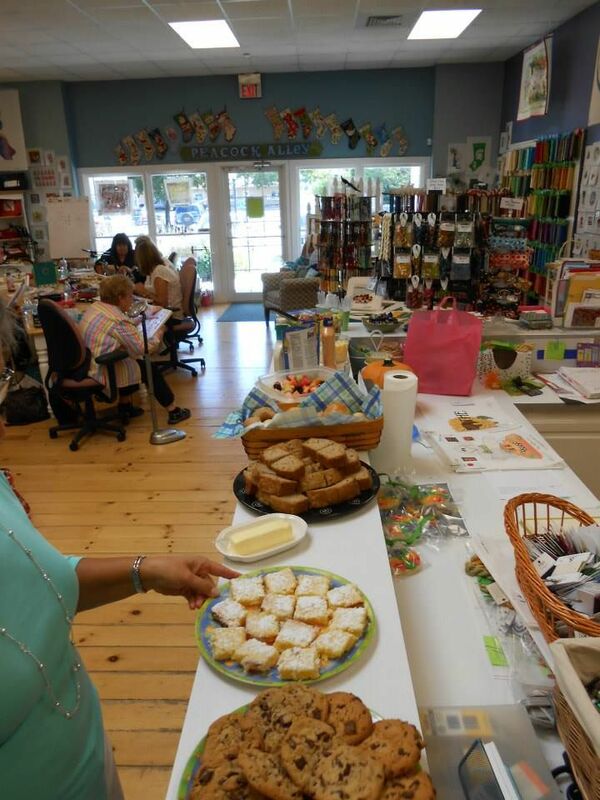 Our lunches were catered by the class angel, Laurie. She is the best! 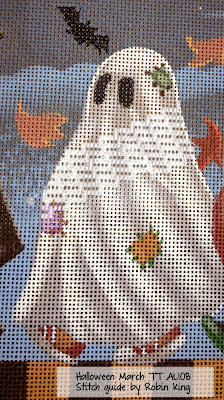 There were good eats at Peacock Alley Needlepoint. 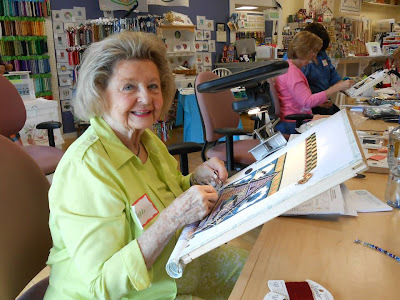 I had the best time teaching at Peacock Alley Needlepoint. I believe everyone had a good time, too. Hopefully they will send me photos of their progress. Anne working on the Haunted House Banner.